Bookmarklets are small scripts that can run independently inside of the favourites or bookmarks of your browser. We have created a couple of these bookmarklets to help you do some things in Facebook that will save you time keeping this tutorial shorter. Only use bookmarklets from a source you trust because they could potentially steal personal information or takeover your accounts. Getting Started: Drag the starred buttons below onto your bookmarks bar and for more detailed video instructions check the link for your browser in this bullet list. Often you need to get to the bottom of a facebook page to get information off of it, this is the bookmarklet to do that no matter how big the page is and wont stop until it gets to the bottom. It has a setting at the beginning 1000 milliseconds, make this larger 1500~2500 for massively long pages. Hit Escape key or refresh page if you accidentally hit it twice or need to stop it. You need to be on your Facebook groups page for these 2 bookmarklets to work when you click on them. They create and download some small files to help you track which groups you've already shared with. The first, FB-Groups TextList, just creates a small plain text file which is ideal for copying and pasting into a spreadsheet for more complex tracking management or just editing the text to identify your top 50 relevant groups. 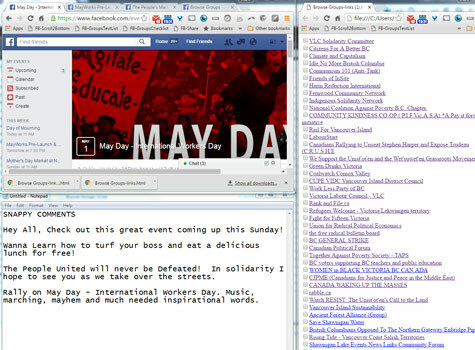 The second bookmarklet, FB-Groups CheckList, creates a web page document with links to each of your groups along with a checkboxes before each one. The links will also open in new windows so you won't accidentally erase the marked groups you've checked if you click on them. Visiting each group before sharing is good to see if anyone else has already shared a similar item recently in which case you can boost with a like or comment. It can also be helpful to share the post from one group to another group thereby initiating a connection Facebook trending will notice. The bookmarklet FB-Groups Checklist shown in the setup picture below. TIP : Facebook appears to be sorting your groups by "Last visited" these days so visit the top groups you want to share in and they'll be at the top of your list. This will open a small window to share the page you are in, if that page is a Facebook event then it attaches the link appropriately. If you want to share a specific post or picture that is not an event using this bookmarklet you'll need to open the post in its own permanent link page which is hidden in the time stamp, for example "5hrs ago", "Yesterday at 9:00pm" or "April 27 at 10:08pm". TIP : "Inviting" your friends to an event will always be more effective than "Sharing" but alerting different groups of an event helps to give it trending status as friends of friends comment or like on a "Shared" post. Basic method is to identify groups that would find your sharing of posts or events relevant and setup a workflow to streamline the process while continually modifying the shared comments so as to not appear a spambot to Facebook. TIP : If you share an item with groups that are largely not local or related to the item you will increase the chances that someone will report you maliciously especially in larger groups with member numbers over 5000. You'll need two or three windows visible in a split screen setup to speed through the steps, I prefer 3 windows in a left top & bottom 1/3rd split and right side 1/3rd split. Split screen is usually the easiest to arrange multiple windows you will be jumping back an forth between as long as you have a large enough monitor. This means resizing your working windows so they are side by side instead of behind one another. Why all the fuss about setting up groups? Facebook has purposefully made it tedious to share events or posts in many groups in one sitting, so as to discourage mass sharing. In fact if you are successful at using the following steps fast enough at around 40-50 shares Facebook will alert you that you are not using the feature correctly and if you continue they will block you from sharing. This should take between 30 min to 1 hour depending on your speed to share with about 50 groups. Click "Share on your own Timeline" dropdown then "Share in a Group"
Using the same comments over and over will hasten Facebook blocking you so change it up as much as possible and if you find yourself blazing through at a rate of 3 shares per minute because this setup has made it so easy...slow down and slightly customize every share comment you post. If you do get the Facebook warning about sharing incorrectly then you might get 3 or 4 more shares but why risk it, accept the warning as a badge of honour and wait 6 to 24 hours before trying again. TIP : As group interests change while you progress down your list keep adding new relevant prepared comments to use which helps avoid being reported a spammer. Remember almost every social or environmental issue relates to another and it is your job to point out those connections. TIP : Some groups wont let you share events or posts, make note for future reference and time saving.